I decided to make a special trip out to Burnaby to take a picture of this sign, because I heard from my mother earlier this week that the owner, Helen Arnold is quite elderly and will probably be retiring soon. Even if you’ve never been inside, you have probably seen the sign for the children’s clothing store. It’s very hard to miss. It’s been a landmark in the Burnaby Heights area since the 1950s and is one of the few authentic neon signs from that era that still remains in the Vancouver area. 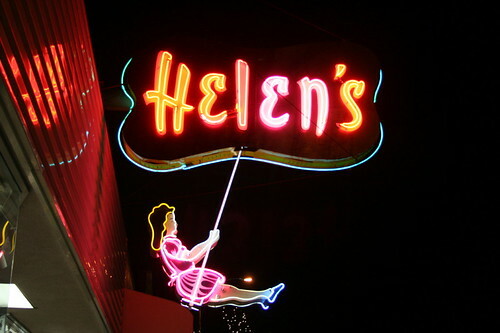 But sadly, neon hasn’t been in style for a long time, and Helen’s sign costs many hundreds of dollars per month to maintain. If the store doesn’t remain open under a new owner, the future of the sign is uncertain. I, for one, would miss it. The Burnaby Now did a feature on the sign a couple years ago, which can be found here. Are you kidding me? Moving from Toronto, the amount of neon, *especially* on new construction, is astounding. From what I can tell it’s a permanent fixture of Vancouver style. There’s no way your typical IGA, Winners, or independent dry cleaner in Ontario would shell out for neon like they do in Vancouver. Now, maybe it’s not hand-made, but I’m not sure the decline in such work is specific to the neon industry. Wallace of Wallace neon had a rearing grizzly bear next door for Bob’s Sporting Goods. Helen’s, as noted in the historical plaque outside, was Burnaby’s city hall offices for much of the 1940s and 1950s (pop 10,000 in those days) and only the Gilmore and Kingsway strips had much in the way of population. (Get thee to Burnaby City Hall Planning office for the Millennium map of Burnaby, online segments at : http://www.city.burnaby.bc.ca/residents/about/hstryh/hstryh_chrtch.html especially the 1920s, 1950s comparison. Bob’s dropped the neon, lease was too much per month, several decades ago. The plain painted plastic and fluorescent tubes is much, much cheaper. That’s very interesting, Bill. Kudos to the City of Burnaby for putting together such a valuable resource. Wrenkin, perhaps Vancouver has more neon signs than Toronto, but what exists today pales in comparison to what came before, artistically and otherwise.